Thousands of people around the country have been marching and sitting in to protest the planned coronation of serial sexual predator, bully and proven liar Brett Kavanaugh to the Supreme Court. Here in the SF Bay area, a protest is planned for this Thursday, Oct. 4 at the SF Civic Center. Elizabeth Rasor, a former girlfriend of Mark Judge has made repeated attempts to contact the FBI. She says she has information to impart. The FBI apparently is not interested. Despite the extremely limited time frame of the “investigation”, as of Sunday the FBI had not contacted Blasey Ford. A former classmate of Deborah Ramirez recalled hearing her tell about her experience with Kavanaugh within days of his molestation of her (Ramirez). He, too, tried contact the FBI. To no avail. “I thought it was going to be an investigation, but instead it seems it’s just an alibi for Republicans to vote for Kavanaugh,” he said. 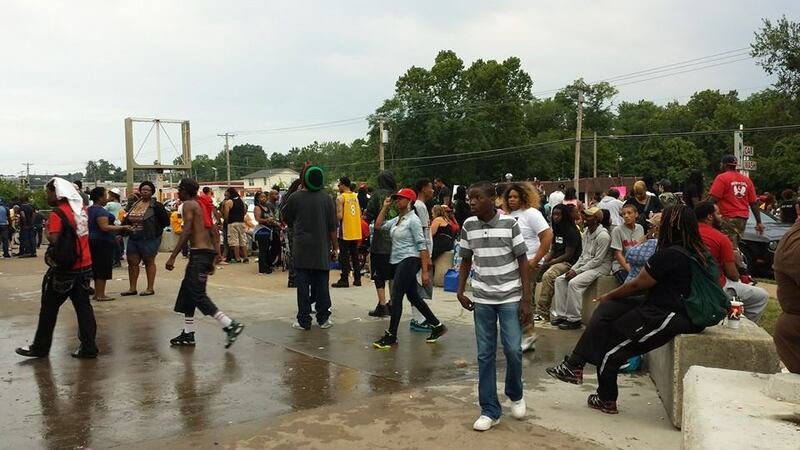 Ferguson community gathering at the QT lot after Michael Brown was killed. A UAW member commented that his local leadership had told him “this is not our battle.” It’s little different now. 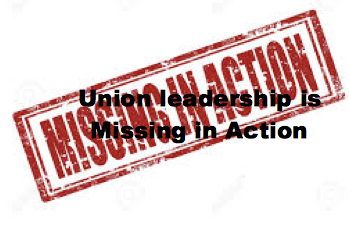 But we must also ask ourselves: Where… where… is the union leadership? It’s true that a lot of union members – mostly male – are probably supporting Kavanaugh. That makes it all the more important for the union leadership to be front and center on the issue. How, after all, can women workers trust their male fellow union members if they- the men – slough off sexual harassment as being unimportant, or if they simply dismiss the experiences of the survivors of such harassment and molestation? This could be a “teaching moment”. Instead, while protests are being held throughout the country against Kavanaugh, the AFL-CIO is suggesting making phone calls to your senator, but ignoring the issue of Kavanaugh’s sexual harassment and molestation! (Never mind the fact that he repeatedly lied under oath.) The fight to stop Kavanaugh should also involve the fight to transform the unions. 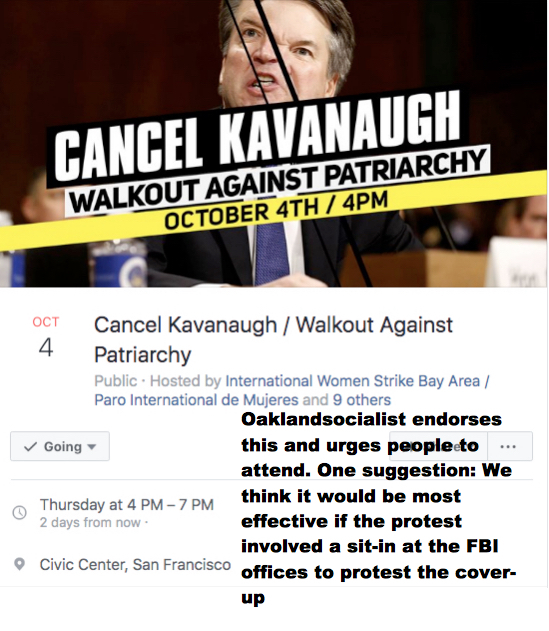 For those in the SF Bay area: There will be a protest at the SF Civic Center on Thursday, Oct. 4 starting at One final suggestion: Instead of confining ourselves to the safe and legalistic marches, we should be organizing sit-ins at FBI offices to protest the cover-up.